Community cookbooks are fascinating food history as they document what groups are eating in specific geographic locations within exact time frames. It would appear that with any gathering of women who belong to a group (church, school, crafting, musical, etc.) eventually they will gather together their combined favorite recipes, have them published and sell them as a fundraiser. The PTA at my children's elementary school did just that in 2006 with a few recipes of my own included. When cooking from a Community Cookbook that has recipes from people you know, it adds another layer of community - I enjoy contacting the people whose recipes I use to tell them that I was thinking of them while cooking along with their wonderful recipe. Wondering when they began? Would you be surprised to learn that here in the United States we've been producing Community Cookbooks since the Civil War? Just like the Signature Quilts I spoke about in Episode 21 where a few women made Signature Quilts during the Civil War to raise funds for uniforms and supplies for the soldiers, Community Cookbooks also had their beginnings during the Civil War as a way to fund raise for the Northern cause. By the time World War I came around, approximately 6,000 had been published (go here to read Michelle Green's Food & Wine Dec '02 article for more). 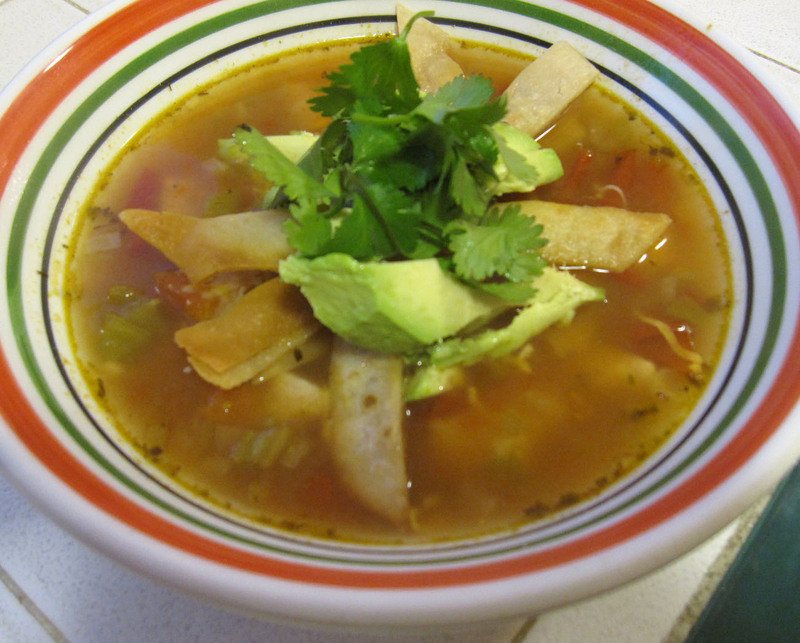 Last night for dinner I made Chicken Avocado Tortilla Soup from my local Community Cookbook. Not only a light soup, but it's a real time saver as the chicken is cooked in the broth. Start to finish this recipe took me about 40 minutes to prepare. It's also a very adaptable recipe based on your tastes as you can make it as spicy as you like, add in more tomatoes or chicken, omit the cheese or avocado, etc. In a large pot suitable for soup, heat up the olive oil and add in the onion and garlic and gently cook for about 5 minutes. Add in the cumin, oregano, cayenne and pepper and let cook about 1 more minute until fragrant. Add in the broth, tomatoes and green chilies. Bring to a boil and then let simmer for about 10 minutes. While broth is simmering, cut up the chicken into small 1/2 inch slices. Remember this is a soup in which you want the chicken to fit in your spoon. Meanwhile heat up a pan (I used my cast iron) on your stove top and add enough oil to lightly coat the bottom. 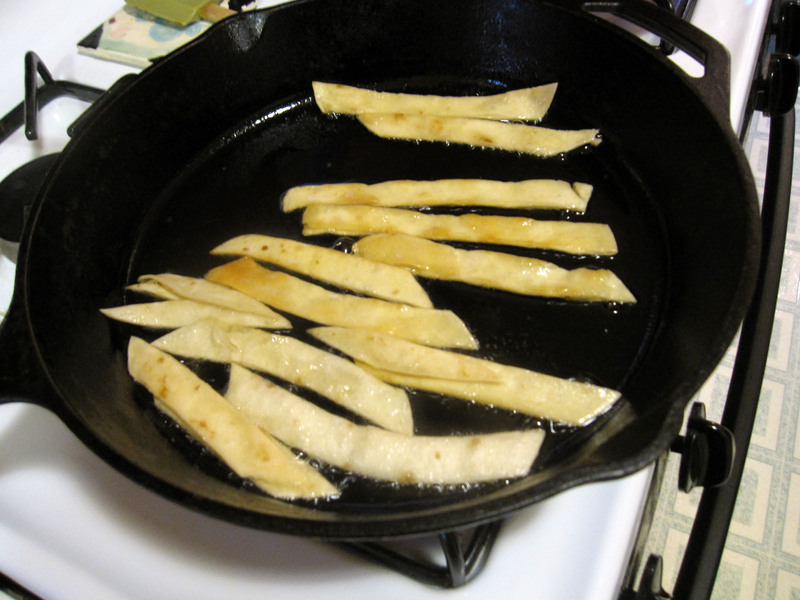 Add in the tortilla slices and fry just until both sides are crisp. Transfer to a paper towel lined plate for later. Tortilla slices frying up in the cast iron pan. After the broth had it's 10 minute simmer period add in the chicken and let cook about five minutes. Because the slices are so small and the broth so hot, it will cook to the necessary temperature very fast. This is not something you want to let simmer on your stove for long as the chicken will get tough. Tough chicken is not good. Now you are ready to plate. Ladle the soup into bowls and garnish with the tortilla slices, avocado slices, cheese and cilantro to your taste. Let me know if you make Chicken Avocado Tortilla Soup and what you thought of it. I will be calling my friend who added this recipe to our Community Cookbook to let her know I made it last night. I haven't spoken to her in ages so I'm looking forward to connecting again over food. Enjoy your Friday - be productive and eat some good food. I love thia post. I have several community cookbooks from different quilt guilds. My favorite community cookbook is one I bought in Hawaii at an art festival. I love community cookbooks! I have a couple from church groups from when I was a kid, and I was the publisher/editor for the church cookbook from the church we left in Texas. And now the church here is gathering recipes for one. I will definitely be trying this soup on my family. Your soup looks fabulous, Susan! I love community cookbooks and always try to find one for the area I am in when on vacation. Junior League and church cookbooks always have the best recipes! I love community cookbooks! I have a small collection of some local ones, and then also a cookbook from the Taipei Int'l Women's Club that my dad got from the Navy Exchange in 1967. I haven't made chicken tortilla soup in a while, though I'm not sure why. My whole family loves it and I'll have to put it back into rotation. I will admit, though, that my tortilla strips come in a cute little bag with a mission on it.